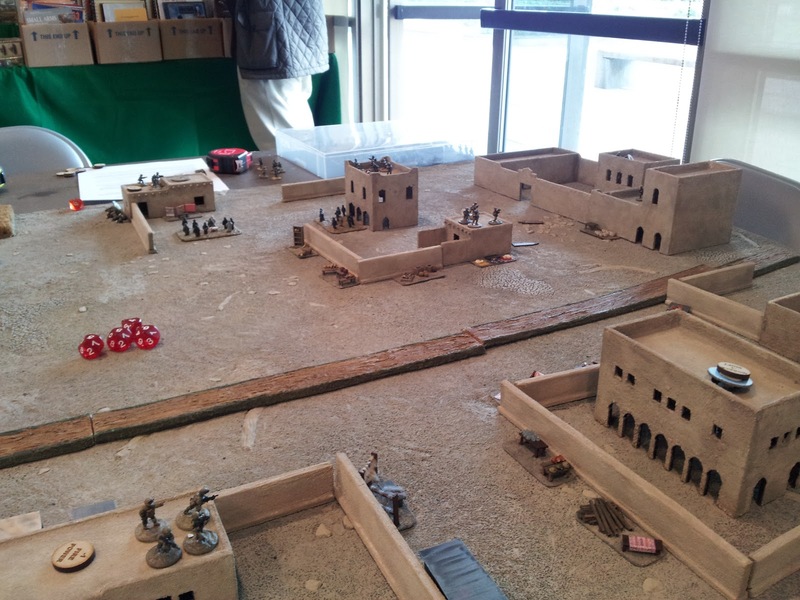 Here are a few photos from my "Busy Day In Kandahar" game from Trumpeter Salute. Unfortunately the battery on my phone died before I could get any photos of the second game, "Bomber In The Bazaar." Busy Day In Kandahar was notable mainly because it's the first time in any of my Force On Force games where the Coalition forces were able to eke out a win! 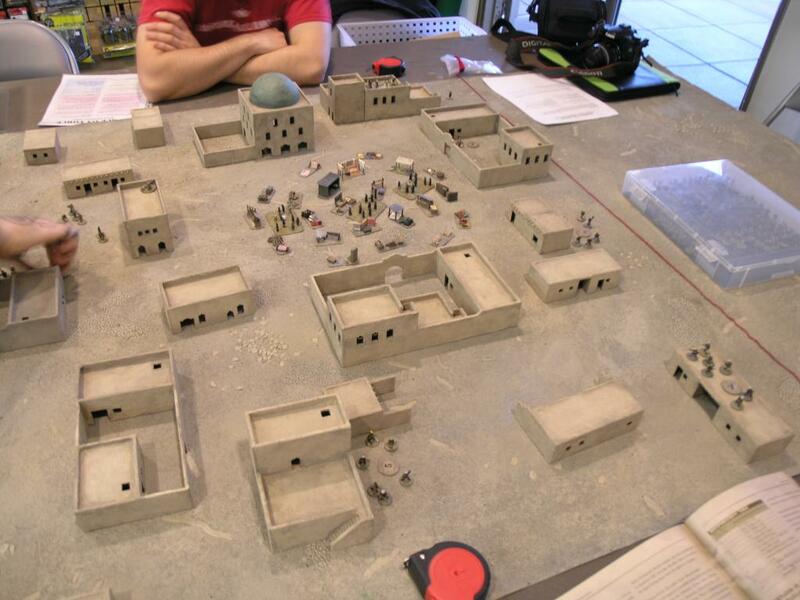 We didn't play through the full 8 turns, but by the time we finished almost every Taliban fighter on the board was dead or had fled. 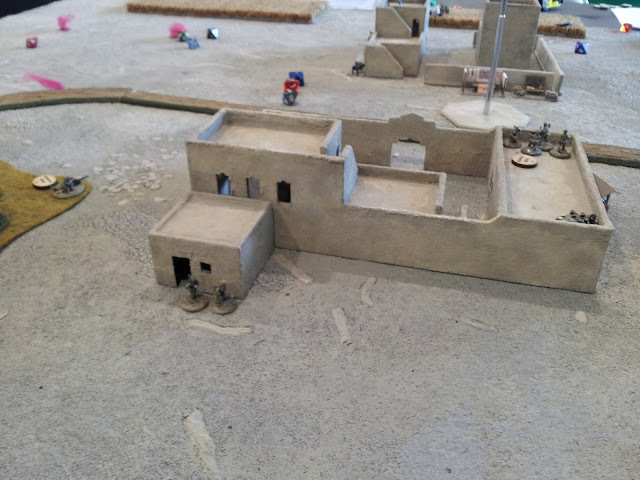 Canadian fire was very effective, having wiped out both Taliban MG teams and one of their sniper teams in the first turn. Another major factor in the game was Fog Of War cards, causing mayhem for both sides all over the board. I really like the cards. They add a lot of the unpredictable and random elements you read about, but which are hard to replicate in a game. 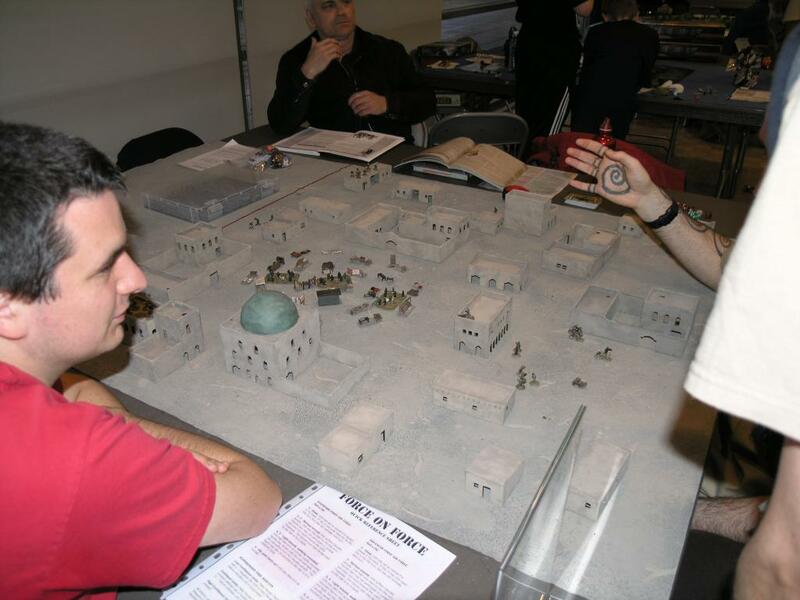 Radio problems, IED and old Soviet mine strikes, interference from higher command, low ammo, random mobs of civilians, and all sorts of other events had a big influence on the game. 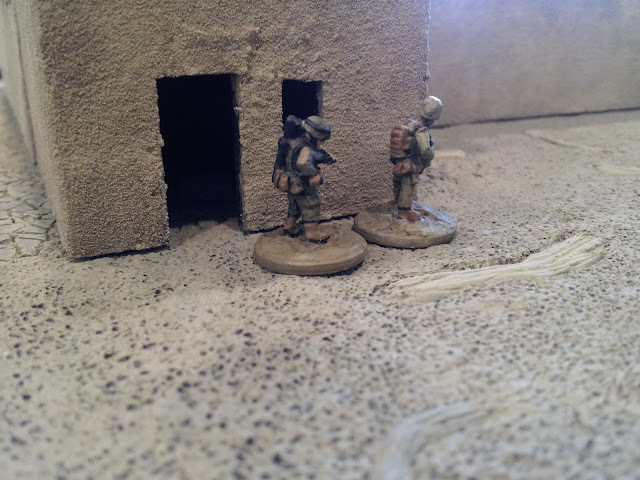 Canadian section commander and medic position themselves to watch over both the rescue of the wounded soldier and the EOD team. The EOD team, supported by a 2 Section fire team, wait for the area around the IED to be secured before getting down to business. 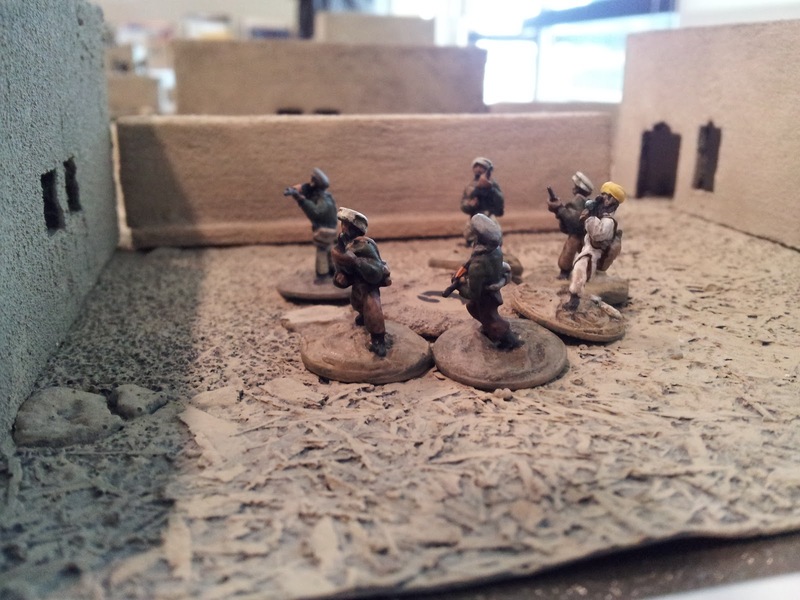 A Tier-one Taliban team arrives near the IED. 1 Section, having pulled the wounded soldier into the cover of a nearby building, lay down fire in three different directions at the Taliban. The small building in the upper left was the scene of several bloody assaults, after a Canadian fire team was captured by Taliban and subsequently rescued by their comrades. 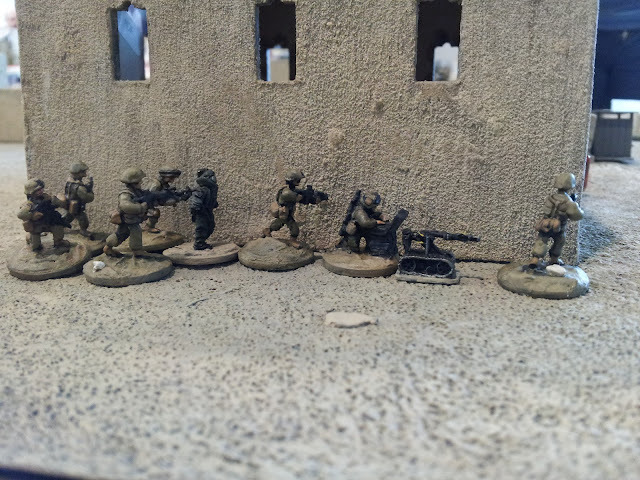 Canadian sniper and GPMG teams, with help from an infantry section, watch over the HLZ. 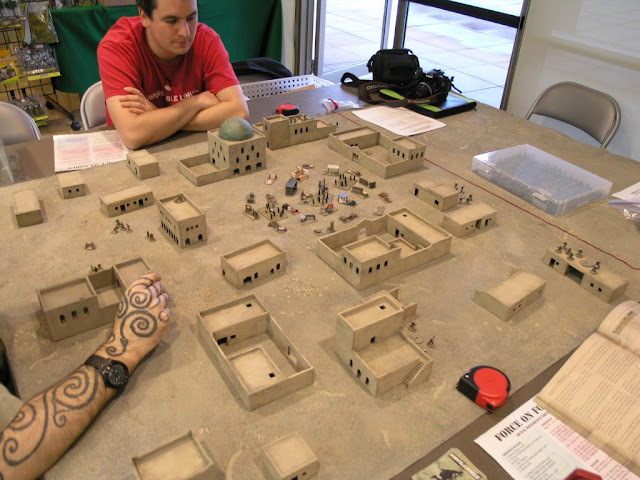 The terrain looks very effective and I too enjoy those fog of war cards. Very nice looking terrain. Always nice to see some Afghanistan games with the different Coalition nations. Keep up the great work!